Collecting comic-books is a long, slow hobby, not for the impatient. Unless you begin reading a series on issue #1, and continue to collect it month after month, it is often quite a challenge to own a complete collection of any series. Even if you begin on #1 and work your way up, the longer a series lasts, the harder it is to own every issue. Sometimes an issue will sell out before you get to the store on "new comic-book night." Or sometimes you will be on vacation the week the new issue comes out. Some of this can be remedied by subscriptions (either through the company, or through your local comic-book shop), but even these cannot proceed forever without error - items can be lost in the mail, and stores can make mistakes. Thus, as time goes by and the series lasts longer and longer, it becomes all but certain that there will eventually be a few gaps in your "run" of comics. And that is only true for series you began reading on #1. If you begin, instead, somewhere in the middle of a production run, say on issue #35, then it is even more difficult to acquire the entire run. If you desire to do so, you must haunt local comic shops, conventions, and online retailers, seeking with endless patience those issues that will complete your collection. Fortunately, as you build your way back into the earlier issues, slowly crossing them off your "wish list," you will find that most good comic-book shops will have commonly available copies of old issues for you. But sooner or later there will come a point where you have every issue available from your retailer, and every one you can find easily at the conventions or online. And there will still be a few issues missing. These are the dreaded "rare" issues. Finding them will be difficult, and buying them expensive, because comic-books increase their value based on a combination of rarity and demand. And so, every collector of a long-running series will hit a "wall" where he or she has all but a few issues, and those issues seem to be actively resisting entry into the collection. 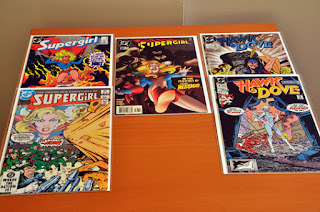 When I bought The Daring New Adventures of Supergirl in the early 1980s, for instance, I began around mid-series (#10 or so, I believe), and had to work my way backward through the back-issues. In those days all we had was one local comic-book shop, and I was lucky that they had most of the issues I sought. But two issues before #10, and two issues in the 20s that I missed for some reason (I no longer remember why) were impossible for me to find back then. Over the years, I tried various vendors and retailers, but I could never get my hands on those last issues. Finally, last month, Mile High Comics had two of them. And this month, I found the last two (#7 and #22) at MyComicShop.com. Today, I received these two issues, and finally, after 30 years, my collection of this series is complete. Similarly, after my original copies of Hawk and Dove from the late 1980s were destroyed in a flood, I worked long and hard in the 1990s to re-acquire them. After much work, I once again owned the entire 5-issue mini-series by the Kesels, and all but two issues, #2 and #8, of the full 28-issue series. Once again, like the last few issues of Supergirl, these two issues of Hawk and Dove were remarkably difficult to find. I was unable to do so in the 1990s. Once again, MyComicShop.com came through, and I received both of those issues in the same shipment. Thus, today, after decades of waiting and searching, I have managed to complete two old collections of my favorite comic-book series. I have been waiting a long time to do this, and on the one hand, I was quite thrilled to open the box and finally receive these issues for which I had been searching so long. On the other hand, there is a sadness to acquiring these issues. They are the last two installments of long-canceled series that I had loved very much as a younger man. 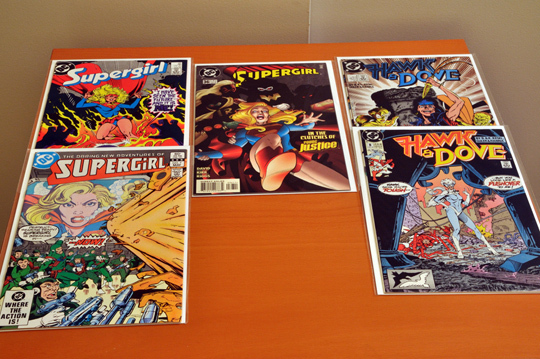 Until I got them, there were always issues of The Daring New Adventures of Supergirl that I hadn't read yet. That version of Supergirl is long since dead (killed in 1985 by the editors of DC), and there are no more comics ever coming out about her again. But until today, there were still two stories about her that I had never read, and could still look forward to reading for the very first time. In a sense, when you are still looking for more issues of a canceled title, it's almost as if the title, for you, is still going on. There are still more stories you can read. When you get that last issue, that's it -- there are no more stories by these creators, about these characters, left to read. And so, it is a rather bitter-sweet moment today. It's nice to complete these old collections and finally fill in the last gaps. But it's sad that I will have no more Hawk and Dove or Daring New Adventures of Supergirl issues to buy any longer.